The level of ridiculousness to which some people will go to be PC (especially here in Oregon). Up in Portland, in Pioneer Courthouse Square, the heart of the city, they have a tree lit for the season. It's not called a Christmas Tree, of course, because that might make those who are not Christians feel excluded. That much I'm used to. What's amazing is that it's not even being called the Hannukah Tree or the Kwanzaa Tree or the Solstice Tree or the Festivus Tree or even, for that matter, the Holiday Tree. Oh, no. None of those. So what are they calling it? "The Tree at Pioneer Courthouse Square". So if it's not there for the Holidays, why is there a tree? Oh, it's there for the Holidays, alright. The Square's website even proclaims, "Each year, downtown's holiday festivities begin when Portland heralds the arrival of the City's most spectacular 75ft Tree." So it's a tree for the Holidays. But it's not a Holiday Tree. If this blog becomes inactive, it's because my head has exploded. Oh, really? Do you, Brian? The rest of you may do as you like with this information. Thanks for the Memory to Dean Esmay via Blackfive. And Thank All of You for Your Prayers and Support. Wade just called to tell me that Donna is doing much better. She is not taking any more morphine and is not complaining of pain. She is no longer throwing up and is very alert. She does not have a twitch now. He does not notice any hearing loss. She is going back to sleep now and he is going home to get Emily to bring her back for a visit. Thank you doesn't even begin to cover it. I'm glad I am on break, because I could not take a customer call with the tears welling up in my eyes and the catch in my throat. I'm so relieved that my dear aunt is doing well, and I'm overwhelmed by the amount of gratitude that I have for all of you for how you stood in the gap for us. I have friends I've never met, but will never forget what they've done for me and mine. "I thank my God in all my remembrance of you, always offering prayer with joy in my every prayer for you all..."
December First is the opening day of dungeness crabbing season. 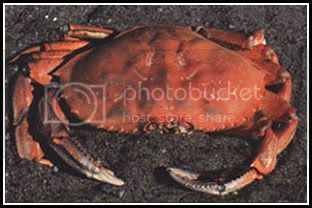 I'm taking Monday off, since Wednesday is the Feared Redheads mumble mubleth birthday, and we're going to make sure we're at the fish mongers when the days first crabs come out of the pots so that we can have them as hot and fresh as possible. The smile I'll have should be visible from space.